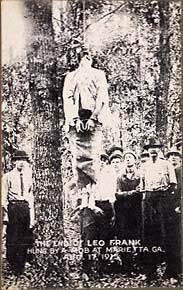 The lynching of Leo Frank. August 17, 1915, Marietta, Georgia. Gelatin silver print. Lithographed postcard. 3 1/2 x 5 1/2"
Superimposed over the image: "the end of leo frank hung by a mob at marietta. ga. aug. 17. 1915." Image ©2002 collection of James Allen and John Littelfield. All rights reserved.